This year, nearly 10,000 people around the world harnessed data science principles in a massive effort to improve the detection of lung cancer – the deadliest, and most common cancer. 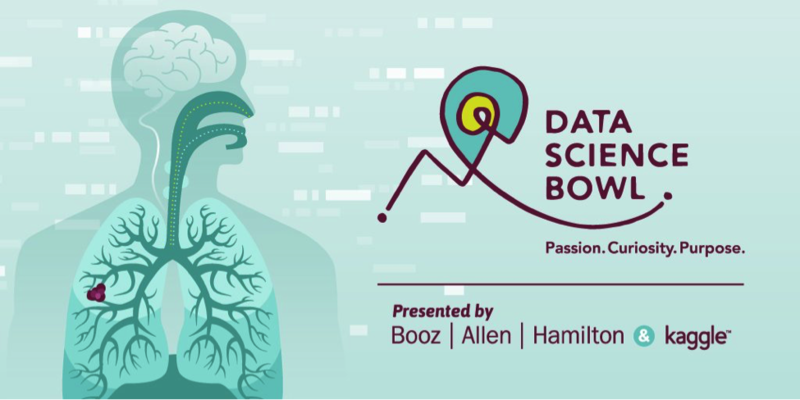 The third annual Data Science Bowl, hosted by Booz Allen Hamilton and Kaggle, challenged data scientists to help medical professionals detect lung cancer earlier, and with better accuracy. A record number of participants rose to the challenge, spending more than an estimated 150,000 hours of collective work to produce nearly 18,000 algorithms. Lung cancer is the most common type of cancer worldwide, affecting nearly 225,000 people each year in the United States alone. Low-dose computed tomography (CT) is a breakthrough technology for early detection, with the potential to reduce lung cancer deaths by 20 percent. But, the technology must overcome a relatively high false positive rate. “Reducing the false positive rate of low-dose CT scans is a critical step in improving the accuracy of CT screening of lung cancer and having a positive impact on public health,” said Keyvan Farahani, Program Director, National Cancer Institute. Data Science Bowl participants created algorithms that can improve lung cancer screening technology by accurately predicting when lesions in the lungs are cancerous, thereby dramatically decreasing the false positive rate of current low-dose CT technology. “This is one of the most important competitions Kaggle has ever hosted, and the results are incredibly promising,” said Anthony Goldbloom, CEO, Kaggle. For more information on the Data Science Bowl, including past winners, visit: www.datasciencebowl.com.